Are you embarrassed by your credit card balances and credit score? Come to think of it, perhaps those numbers aren't such a shock. Some of us may be self-conscious about our age and how heavy we are, but people can usually just look at us to see the reality. There's not much point kidding them or ourselves, and revealing the numbers behind what's patently obvious is a small step to take. However, many apparently prosperous people are hiding low scores and high card balances. When FICO, the biggest credit scoring company, last calculated the figures, it found that nearly one in four Americans had scores below 600, and close to half (46.9 percent) were in the 300-700 range in October 2013. Of course, many in the low ranges must by now have given up feeling embarrassed by their scores, while some who hang out in a super-prime crowd may be ashamed of numbers that most of us would envy. Everyone knows that maxing out a card is unlikely to do your score any favors. But fewer recognize just how close the link between card balances and good credit are. This has little to do with the raw dollar amount owed, and a whole lot to do with the proportion of your available credit you're using. In the lending industry, this is called your credit-utilization ratio, and is expressed as the percentage of your card credit limits you're actually using. So supposing you have four cards with combined limits of $20,000. If your combined balances are $8,000, your credit-utilization ratio is 40 percent. But, if you're aiming for a great credit score, that's too high. "You want to keep your balances on your credit cards below 30 percent as a minimum, if not lower," Anthony A. Sprauve, FICO senior consumer credit specialist, recently told WisePiggy.com. "Thirty percent or less is the magic figure. You're rewarded a little more for 20 percent, and a little more for 10 percent, but the difference between 10, 20 and 30 is minimal." Of course, credit-utilization ratios are only part of the scoring picture, but they're an important one. FICO says that the amounts you owe makes up 30 percent of your score, making it second only to your payment history (paying punctually accounts for 35 percent) in importance. Unfortunately, the third and fourth most important factors are the length of your credit history and new credit, which together account for 25 percent of your total score. That credit history calculation takes into account the age of your oldest and newest accounts, and well as the average age of them all. And this means simply applying for extra plastic to increase your cards' combined credit limits isn't always the best way to manage your credit-utilization ratio. Just one new account can set your score back, though not always by a lot, or for very long. So the smartest route to driving down your credit-utilization ratio is to pay down your balances. However, it's important to get this in perspective. "As long as you don't use a new account to spend more than you can pay in full each month, it can be a real positive for your credit scores. It adds to your open credit limit, thus reducing your overall utilization," says Maxine Sweet, vice president responsible for public education with Experian. 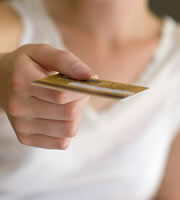 Keeping an eye on your credit is becoming increasingly important. Often the first time a person becomes aware of their identity being stolen is when they see new accounts on their reports that they haven't opened themselves. And such theft is more widespread than you think. On April 22, Experian released the results of a survey it conducted among the residents of Utah. More than half of respondents said they had either been a victim of identity theft themselves, or knew someone who had been. Although this sounds incredibly high (and it may be that Utahans have unusually wide social circles), it's more believable when you look at Bureau of Justice Statistics official figures. Roughly 7 percent of all American adults were victims of identity theft in 2012. Over a period of years, the number of victims is going to become high, and the number of their acquaintances even higher. But it's not smart to monitor your credit just so you can nip identity theft in the bud. The more you know about how yours is changing, the more you can do to actively manage it. And it's hard to think of a time when there were more benefits to having the best score you can than there are today. Luckily, comprehensive and truly free credit score services are springing up, just as the need for them grows. 0 Responses to "Are you embarrassed by your credit card balances and credit score?"